This antique French day bed came from England on our last buying trip in June last year. It has waited patiently in our storeroom until it was time for it to be reupholstered. 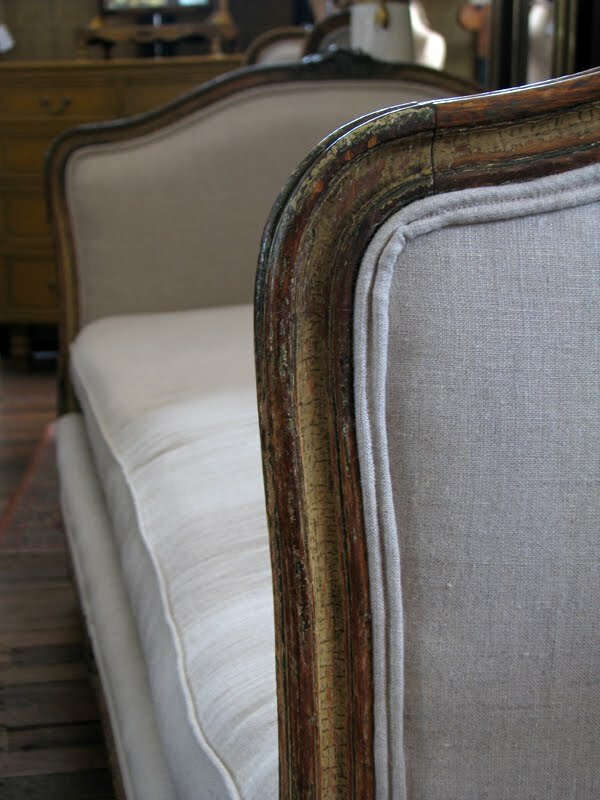 We have chosen Belgium linen as it is a nice contrast with the old carved giltwood frame. 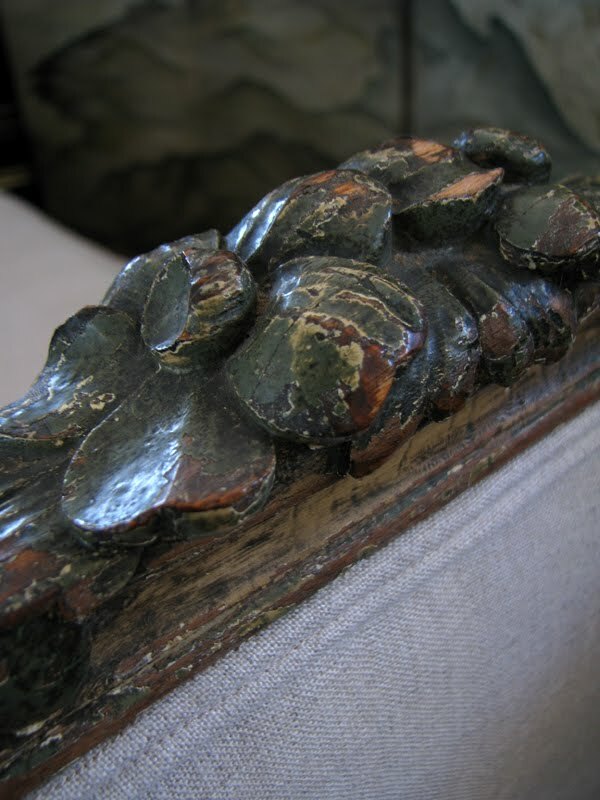 This bed started life in France then went to England. In the 1950s it went to the USA (it still has the old storage labels on it from America) and more recently returned to England where we happened upon it in the Cotswolds. It then made the journey in many pieces to Australia. What a history! 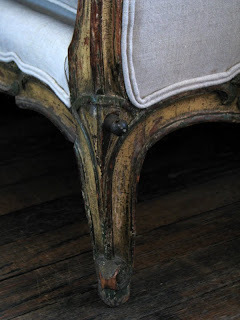 Detail of the carved giltwood leg and the bolt that holds the rail to the end. It is cleverly constructed to come apart into 6 pieces for transportation. Think of the apartment stairwells in Paris that it must have climbed! Gorgeous double piping detail. It actually has two bolster cushions as well (these were not completed at the time I took these images but they are happily on the day bed now). The paint has a lovely worn look, only perfected with age. The bed dates from mid 19th century. A lucky find for us and well worth the effort...this piece is certainly my favourite in store right now! This piece is truly stunning!! And you knowing the history makes it more so. I think most of us would LOVE a piece like this, truly classical. I can just imagine it going up and down the paris apartment stairs too!! Hope you're having a great week. We have had a lot of rain, can't wait to see the sun again. 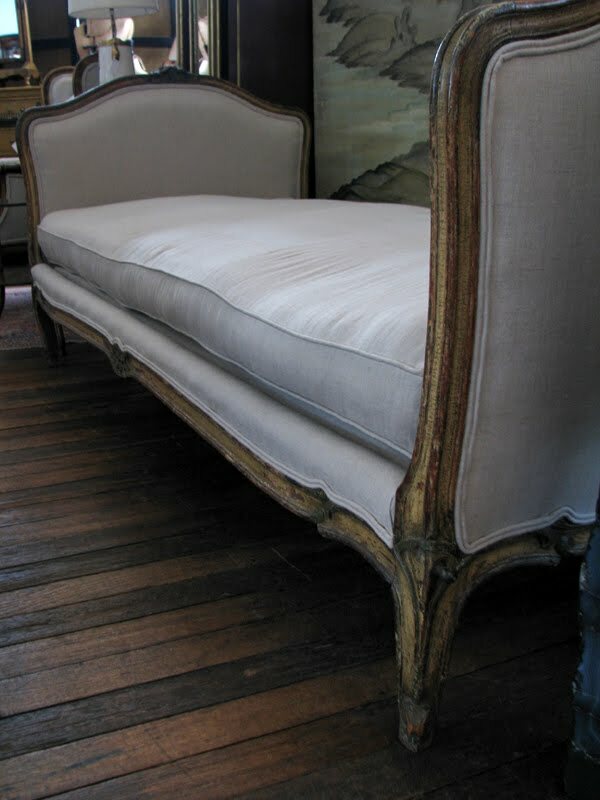 So beautiful ... such a day bed would work wonderfully in any home.